We manufacture and export an enticing collection of Fancy Bags known for rich designs and intricate embroideries. These bags are manufactured using premium quality fabric and as per the latest market trends. We offer these bags in various shapes, sizes and numerous color combinations that go along with any occasion and attire. 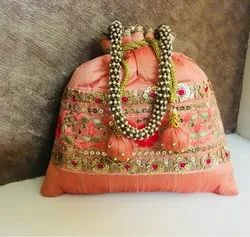 JK handicrafts presents long style short bags in new banjara style mirror fixed at wholesale price directly from India. JK Handicrafts brings to you latest bohemian collection of handcrafted Indian bags at discount prices. Ready to dispatch. Looking toward the ever growing demand of our clients, we are engaged in offering supreme quality range of Embroidered Hand Bags (Black Embroiderry Bags). This Embroidered Hand Bags is extensively used in different regions for carries various personal items. Clients can avail this product in bulk.